During the summer and fall, the park downstairs from my house hosts a lot of volleyball games and tournaments. The teams are made up of local middle and high schoolers, and are co ed. They'll spend the whole day playing and cheering each other on, practicing their digging and their setting on the sidewalks of the park. I thought I would play around with watercolors, but after a few disasters, I packed up my bag and came home. I pulled it out a few weeks later and, thinking back to that day, added in the black ink to define the court and the trees, and the buildings from across the street. Finally, I made a few (tiny) volleyball players and collaged them in. Another good reminder that just because it didn't work out on location doesn't mean you can't salvage it at home! The leaves here in New York have been disappointing this year. I think the weather hasn't been cool enough for the leaves to change so they've just stayed green, then turned brown. Ew. But in the park next to my house, there's one circle of trees that went bright yellow. They had already dropped them by the time I made this thumbnail, creating a carpet of yellow underfoot. There's a playground there under the trees, and for the kids it's time to go back to school no matter what the weather does. Fall will always be bound up with school for me, probably one reason I love the season so much. They only had thirty or forty minutes to run around, which was plenty of time to do a quick watercolor. I made this drawing back in August, in the aviary at Animal Kingdom. 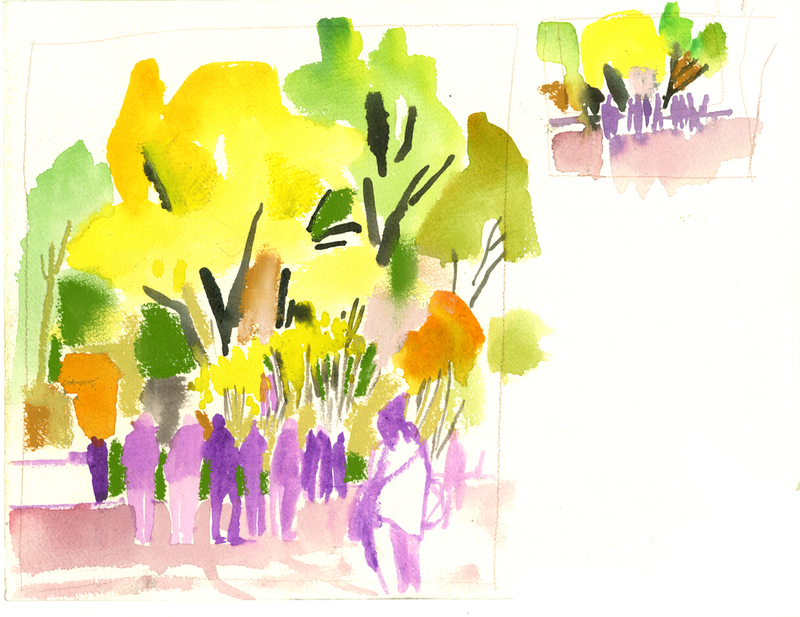 I was interested in the amazing foliage, of course, but I also wanted to convey the individuality of the people walking by. It's 80˚ in New York today. I'm not sure what happened to fall, but I'm happy to reminisce about summer back when I was sitting in a garden, drawing. Last month, I took a trip with the Dalvero Academy to Seattle and San Francisco. I'm just starting to go through those drawings now, and I just knew the first thing I had to share was my favorite place in Seattle, Gasworks Park. As some of you may have seen in past posts (like here) I love drawing big, dirty machinery. Basically, if it's industrial, I love to draw it - bonus points if it's old. Gasworks Park is the site of a coal gasification plant that closed down in 1956. Then the city of Seattle bought it and said, "So what if tar still occasionally oozes from the ground? Let's make it a park!" And so they did, and it's awesome! They even built a kite-flying hill. I love Seattle! I might post some other studies of Gasworks Park another time. In the meantime, check out my friends here and here to see some of their Seattle drawings! I was thinking back to where I was a year ago - Paris! I realized as I was looking through at some old drawings, that I never posted any drawings from the Tuileries. I can't think how I overlooked one of my favorite parks in Paris. The proportions of the park's landscape are so perfect, you can't help but feel peaceful and relaxed when you're there. Besides being beautifully designed and landscaped, it's located right next to the Louvre. What excellent neighbors! A couple of weeks ago, I went with Julia and Kati to see New York Classical Theater's performance of Moliére's School for Husbands in Central Park. Now Shakespeare is the master—hey, I love Shakespeare—but I recently heard a lady on public radio saying that there are a lot of classic playwrights out there, and why should it be only Shakespeare in the New York free theater scene? And I think she's right! There are enough culture vultures here to support an expanded repertoire. So, it's a real treat to see New York Classical Theater do Aphra Behn (a *lady* playwright, thank you very much!) and Moliére. School for Husbands is on for another week, so be sure and see it if you're local! And if you live in Portland, be sure and check out Atomic Arts' Trek in the Park, where they reenact a Star Trek episode! Those of us who won't be able to be there will have console ourselves with youtube videos. Sigh. Before I came to New York for the first time, I imagined it was full of skyscrapers and cars and roads, huge sidewalks crowded with people, but I never thought about trees. Truth is, there are so many trees around New York — giant plane trees, maples, and magnolias — almost every street is lined with them. On top of that, they are great to draw. Their limbs move every which way as they grow, but they're standing still, giving you all the time in the world to draw them! It's been a rainy spring here in New York, which is not so much fun for people, but makes the trees very happy. So here's a little grouping of drawings: trees making their way from bare winter limbs to budding spring greenery. Happy spring! For the locals, here's a handy New York City tree guide, if you're interested. And, training to become a citizen pruner!